RIO Products has released a series of innovative strike indicators designed to help anglers help subtle takes. The Kahuna LT is is a highly sensitive indicator that does not damage or kink the leader. IDAHO FALLS, IDAHO (April 1, 2019) – RIO, manufacturer of lines, leaders, tippet, flies, and accessories for the demanding fly fisher, brings innovative strike indicators to anglers with the introduction of its Kahuna LT. The Kahuna LT is a subtle strike indicator made from a section of high-floating fly line with the core removed. By breaking off the desired length, anglers can slide their chosen piece up the leader through the hollow core where it will grip and stay in place. To make it easy to attach, a wire threader is included in each pack. The result is a highly sensitive indicator that does not damage or kink the leader. The Kahuna LT is available in two sizes; thin for calmer water and lighter weight flies, and thick for fast water and heavier flies. Each pack contains three, 1-foot sections of Kahuna LT in white, orange, and chartreuse. Find them at your nearest RIO dealer for $9.99. 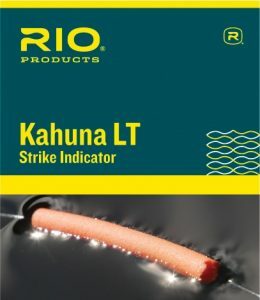 RIO’s Kahuna LT Strike Indicator from RIO Products on Vimeo.